I started with China Glaze Kinetic Candy. I then painted a thick stripe down the middle of the nail with China Glaze Love's A Beach. 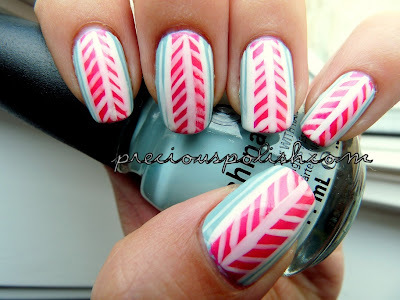 Then I used a white striping polish for the design. Oh! I also wanted to show you some photos, just for fun! Last week I did a 'bungee jumping' type thing with some friends. I started off with a clear base coat. Then I used a makeup sponge to sponge on Sally Hansen Gilty Pleasure on half of the nail and Jessica Smoky Feather on the bottom third. 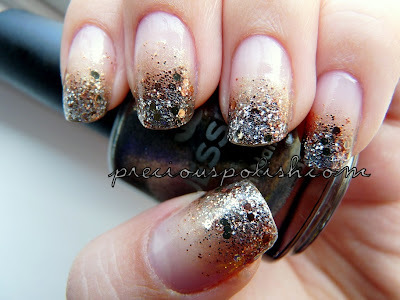 Then I layered Sephora by OPI Don't Be Eggnog-ious, a silver glitter by Love & Beauty and Sephora by OPI Only Gold For Me. So tonight I'm going to a concert to see Hoodie Allen! If you don't know him, he's a really cool rapper with some great tunes. Please check out his song #WhiteGirlProblems. If that song title doesn't entice you then take it from me: it's great, really. On to the nails, Hoodie's tour is called The All American Tour so of course I did a matching manicure with his logo on the thumb. I used OPI Alpine Snow as a base colour on all nails except for the little finger where I used American Apparel Mount Royal. 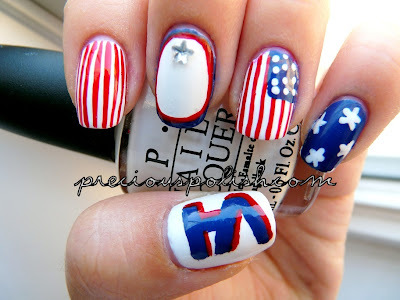 I did all the details with dotting tools and a small brush, except the red parts which were just a red striping polish. Anyway I've been pretty uninspired lately. I sit by my Helmer for ages staring at polishes, trying to think of something to do. 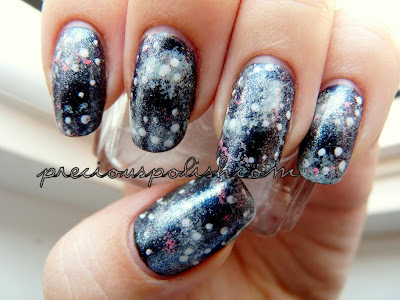 Then I saw a picture of galaxy nails on Tumblr and I had a Eureka! moment. This trend has been going on for ages but I'm finally hopping on the bandwagon now. Better late than never, right? My base was China Glaze Liquid Leather followed by Orly Royal Velvet. Using a makeup sponge I randomly sponged on OPI On Stranger Tides. In smaller areas I sponged on Sally Hansen Lavender Cloud, China Glaze Kinetic Candy and China Glaze Flip Flop Fantasy. I used a dotting tool to add some 'stars' and topped it off with Essie Pure Pearlflection. It didn't come out exactly like how I envisioned but I'm satisfied! It's definitely one of those manicures that looks better from afar :P Thanks for stopping by! The colour you see at the base of each nail is the first colour I put on. For the middle and little fingers I sponged on a regular gradient with a makeup sponge. Then I added some lines with a white striping polish and dots with a dotting tool. For the thumb and ring finger I created an outline of a shape in white, then sponged on a gradient contained in the shape. Added more white lines and some dots and finished it off with a rhinestone. For the index finger I used a solid base, no gradient. The two colours I used were American Apparel Manila and American Apparel The Valley. Ugh, that explanation took longer than expected. 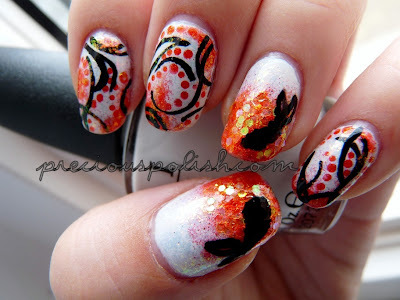 It's an abstract look that was very difficult to photograph and a bit inspired by my "Koi Pond" nails. Salutations! If you've been reading this blog for awhile you may know that I'm a big fan of a nice gradient. I'm partial to glitter (like over here) but I like coloured ones too (like over here). This week the colour gradient trend took over and, naturally, I was pretty ecstatic. I jumped on the band wagon and produced a cotton candy trio with a fine silver shimmer (perfect for a bit of added colour blending). I first started with American Apparel Coney Island. Using a makeup sponge I sponged on China Glaze Sweet Hook, followed by China Glaze Kinetic Candy. To blend it all together I added a coat of Essie Pure Pearlfection. Usually I have to do some transition blending of the colours on a piece of foil but these pastel shades blended into each other without a fuss.